Monday’s meeting was AWESOME! Thank you to everyone who showed up! I’m sorry Nick and Mike couldn’t be there, but they were at the first meeting, which covered roughly the same material. Glad you all liked the pizza TOO! Scan the post below, anytime you see your name, make sure you follow through on what it is you need to do! c. Dena wants a job, but she must be and make a commitment to the meetings first. a. SAT October 29th SO Cal Phil Conference. Members of the SPS NEED to show up to help Tim Black out with anything he may need. That includes handing out flyers and name tags to people. This is a very important event. PLEASE MAKE AN EFFORT TO SHOW UP!!! ii. Phil Department; What about flyers????? iii. Nick and Mike: Post flyers in that special way you do. (2) Work with the professor Donna mentioned (my notes are at home and the name slipped my mind) Donna... can you follow up on that? i. I (jes) can do ANYTHING you want on ANY style shirt. (1) Remind them we didn’t touch a DIME last semester, perhaps? THANKS TO ALL for your dedication to the club. I know some of this stuff is a pain in the bottom, but if we all work together, we can really help out the department, and most importantly, build a strong base for the club. P.S There is lots to be done, and lots that can be done that may not be mentioned. If you see some are the club could be covering and isn’t, and you want to get involved more... take some initiative and GO FOR IT. It’s hard for me to delegate to everyone fairly. If you want more responsibility, then PLEASE take it! I am sad to say, last night’s meeting had very poor turn out. Let’s just say BIG thanks to Tim Black, Nick M. and Mike E.! I appreciate you guys making the time to be part of the meeting. At any rate, we are going to try again for next Tuesday, September 27th from 4.45 -.5.45 in ST 503. I will be ordering PIZZA for the meeting. ALL THE CLUB MEMBERS THAT HOLD AN OFFICE NEED TO MAKE A REAL EFFORT TO SHOW UP, please. 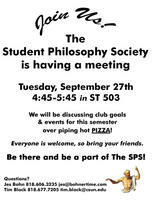 This will be the meeting that sets up our goals and activities for the remainder of the semester. 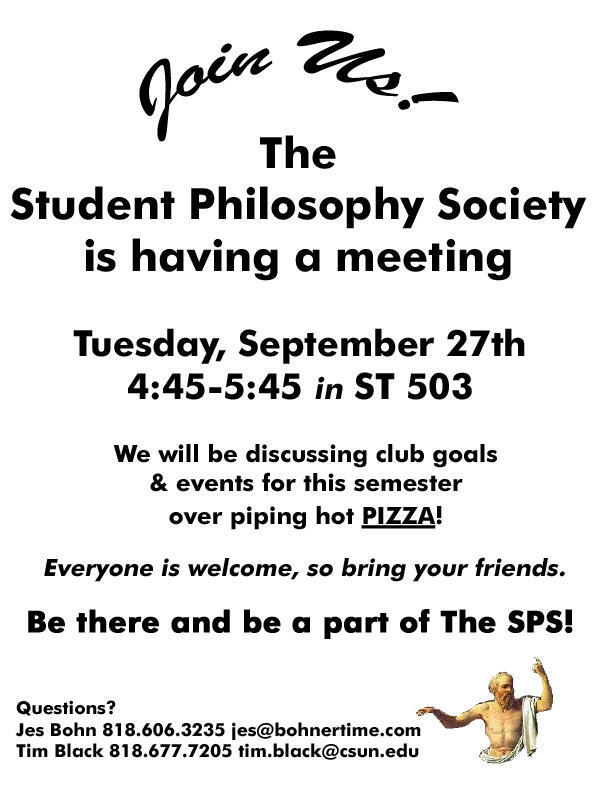 Remember, everyone is welcome, even non-philosophy majors, so bring your friends. The flyer is attached. If I have the time, I will print flyers for the Faculty and Staff and get them out by Wednesday.